1. 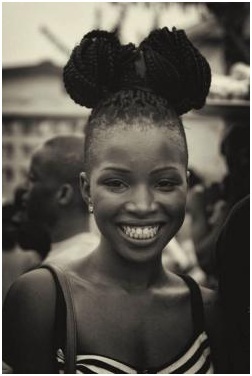 Position the hair into a high ponytail using the large ouchless headband to secure the box braids. 2. Split the ponytail into two pieces. 3. Two strand twist one side of ponytail first, and secure with an elastic band. 4. Two strand the other side of the ponytail, and secure with an elastic band. 5. Take one of the two strand twists and wrap the twist the base of the ponytail and secure with bobby pins. 7. 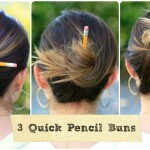 To hide any loose ends sticking out from the bun, tuck them in underneath the bun and secure them with bobby pins. 1. Separate the hair into 2 sections-a front section and a back section. 2. For the front section, put the hair into an off-centered high ponytail. 3. Begin to twist the ponytail into one two strand twist and secure with an elastic band. 4. Wrap the hair around the base of the ponytail creating a bun and secure with bobby pins. 5. Leave the back section of the hair down. 1. Decide which side you would like for the side twist to be on. Begin to move the braids to the chosen side. 2. Starting at the top of the side part, begin to twist the hair away from the face. 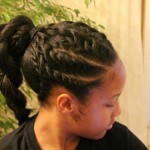 Slowly add more braids to the twist as you move down. 3. 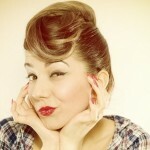 Once you have decided where you would like your twist to stop, secure it with bobby pins. 1. Position the hair into a high ponytail and use the large ouchless headband to secure your braids. 2. Pull the hair through the band again, this time stopping halfway through so the ends are sticking out of the bun. 3. Separate the bun in to two pieces; as you do this it will start to resemble the ends of a bow. 4. Take the leftover ends of the ponytail, and push them backwards. Position the ends in the middle of the bow and secure with bobby pins. 5. 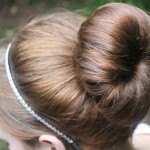 Take the rest of the hair ends and tuck them underneath the sides of the bun. 6. Spread out both ends of the bow.